OpenEVSE provides energy monitoring archetecture for Electric Vehicle Charging Stations as well as energy monitoring devices. The Open Source archetecture provides expandibility to import data from any source. Create custom dashboards to provide the information you need. Dashboards can be private or shared with others. How Fast are you charging? OpenEVSE sends real-time current information which can be viewed and minipulated. The chart above is real-time data from a 40A Charging station. OpenEVSE continuously monitors internal charging station temperatures. If things get too hot charge speed is reduces in several steps. At a critical temperature charging is suspended. How much energy did you use today? this month? this year? 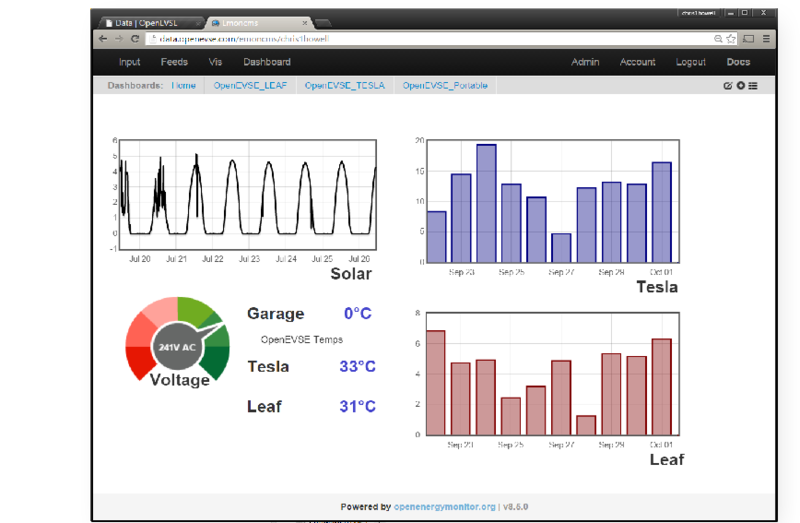 OpenEVSE data services continuously monitors charging performance and counts kilowatts for you. The OpenEVSE Energy management system can accept data from external sources, such as utilities or energy systems. This chart is live data from a 5.8kW Residental Solar in Southern California. The smart design and capabilities of this unit easily surpasses that of manufactured devices. The new lower price nearly makes OpenEVSE a market disruptor and a must try if you enjoy small projects. The polycarbonate enclosure is a thing of beauty. The front panel looks artwork is fantastic. I like it so much I ordered another one. EZ assembly - Ordered what I expected to have to solder. Kit came and was all but built. Just bolt components to back plane and crimp a few connectors and a few jumpers all screw terminals. Great deal, great support.